Bah! Humbug! is challenging us to use images of things that fly and what better flying things are there than angels. Those guardian ones are kind of special. Yes, you do recognize the background paper. My Mind's Eye. 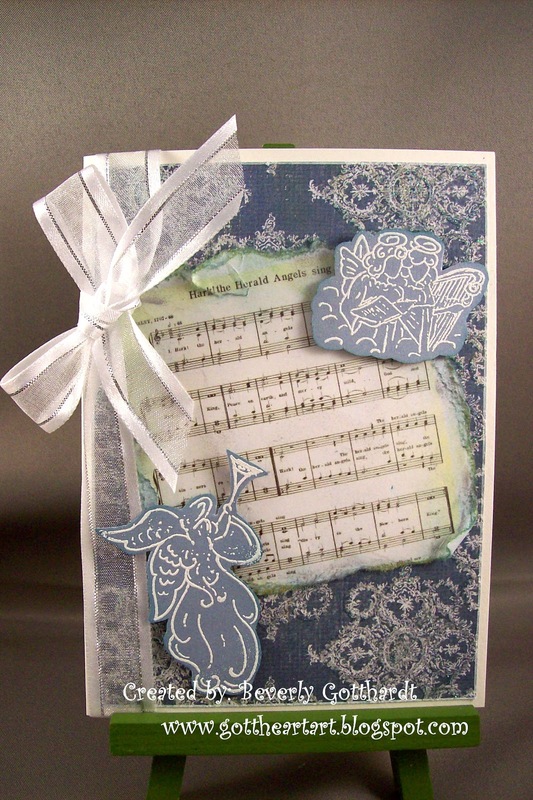 I white embossed the angels on Bordering Blue, printed the music from Google images, tore and distressed the edges, slightly edged the background with a white Sharpie paint pen, and couldn't resist giving this a bow. Come on over to Bah! Humbug! you'll have a great time with all the Humbuggers and you'll have your Christmas cards made to send out before you start in on all the other Christmas preparations. Bah! Humbug! Challenge 8...Things That Fly! 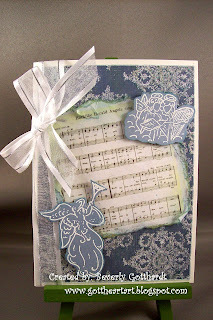 Supplies: White 4" X 5 1/2" card blank Halcraft, Papers: My Mind's Eye Signature Christmas, Stampin Up-Bordering Blue, Whisper White, Stamps: See-D's-Magical Christmas#50317, Ink: VersaMark Ink, CTMH-Z2160 Twilight, Brilliance-Galaxy Gold, CTMH white embossing powder, Google images, ribbon-Hobby Lobby, Stampin Up dimensionals. oh this is beautiful Beverly - very vintage but with a lovely modern twist too. Absolutely stunning Bev - just gorgeous. Thank you for sharing with us at Bah! Humbug!